It was a shock when the Los Angeles Times referred to the area where I live as “the Ribbon of Shame”. OK, I’ll admit that a couple of houses in our neighborhood could use a fresh coat of paint, and yes, there’s a bar a few blocks away that seems to be a good place to meet one’s next mistake in life. Still, I didn’t believe conditions were so bad that we deserved that kind of public ridicule. It turns out that “ribbon of shame” has to do with the peculiar way the boundaries of our congressional district were drawn: It is about two hundred miles long, but as little as a few hundred yards wide in places. What this means is that we have been subjected to a political tradition known as “gerrymandering”. That’s a term that gets thrown around every time there is an election, and it’s almost as old as the country itself. Gerrymandering was coined in 1812, when one of America’s first career politicians, Elbridge Gerry, was serving as governor of Massachusetts. Prior to the election of that year, the Massachusetts legislature had redrawn the boundaries of legislative districts. The Federalists had a statewide numerical edge over the Democratic-Republicans, but by some creative mapping, most of the Federalists were lumped together in the same district, while the Democratic-Republicans gained control of most of the other districts. 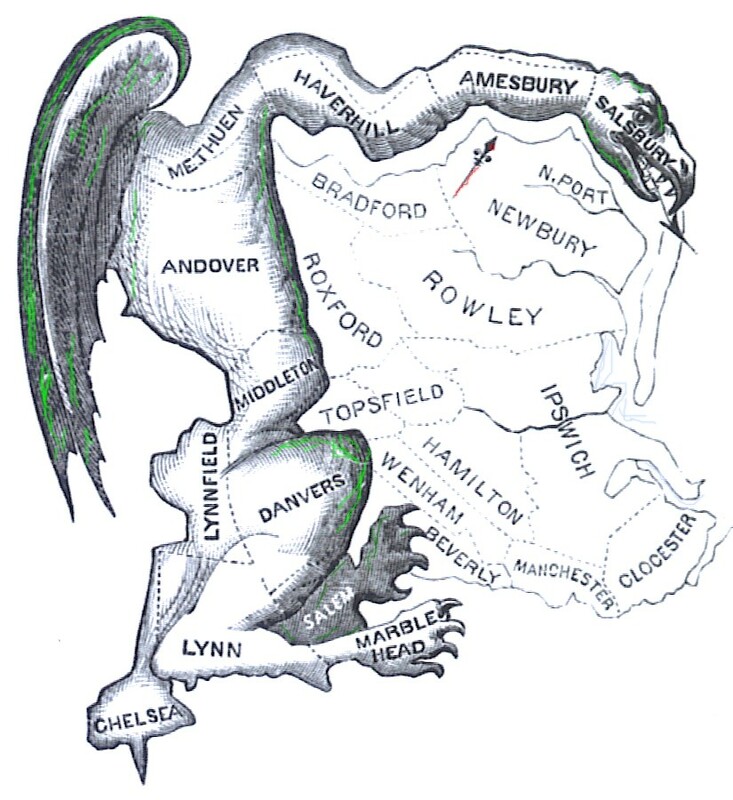 To one cartoonist at the Boston Gazette, the bizarre new political map of Essex County looked something like a salamander, and his illustration appeared in the newspaper with the caption “The Gerry-mander”. It should be noted that it was the legislature that had redrawn the boundaries, and according to some historians, Governor Gerry signed the bill reluctantly. He didn’t even benefit; he got voted out of office in that election. In spite of that, his name has been associated with this questionable political practice ever since, although it is now mispronounced. The governor — who was a signer of the Declaration of Independence, by the way — pronounced his name with a hard G, like “Gary”. Somehow, redrawing districts for political gain — gerrymandering — has come to be pronounced with a soft G sound, as if it was spelled “jerry”. So Elbridge Gerry’s name is linked with a custom that politicians regularly denounce (unless it is done to their advantage). That might be a bit unfair to him, though, because he did serve his state and country for a number of years, and occasionally with distinction. Among other things, Gerry was elected to a couple of terms in the U.S. House of Representatives, was a presidential envoy to France, and was the vice president of the United States at the time of his death in 1814. As for the ribbon-of-shame thing… I’m not feeling so bad about it anymore. I discovered that the guy who started saying that about us was Arnold Schwarzenegger. He has proven to be someone who knows no shame. This entry was posted in History and tagged gerrymandering. Bookmark the permalink. Ray Height would be so proud of you. Thanks, but I’m not sure any of our high school teachers would want to take responsibility for me, Sara. They probably all breathed a sigh of relief when I graduated; especially the chemistry teacher whose lab I almost blew up by accident.